This story has been long in its making. It was long in its making before blogging fell so far down on my priority list that it stopped happening ever except for rare moments of import. This story was long in its making because it’s one of those tales of things spiralling into tiny chronic persecution for months. Pieces of this story start last October when, as part of my November grocery shopping, I find myself standing in the aisle at Costco with a problem. The problem is this: I’m out of yeast. I’ve gotten into a weekly-ish bread making habit and have gone through the jar that spent a long time sitting neglected in my fridge at an alarming clip. At a loaf a week, it’s reasonable for me to buy yeast in Costco portions, especially since it has a three year use date. The problem? I already know that I’m going to be moving. My traditional philosophy of, “I’ll use it eventually,” is no good any more. I don’t yet know where I’m moving to, or when I’m going, but I know it’s less than three years away, so this yeast purchase will, in fact, be affected by my relocation. (Everything was affected) Buy it in Costco quantities, and risk wasting it, or spend the same amount on significantly less yeast at the grocery store with a much lower risk of bacteria-death on my hands? I bought the Costco package. By late March, when the next piece of the story happens, I knew that three years had been an absurdly optimistic time line and I was, in fact, moving before the end of the year, before winter, even. I had a lot of yeast to use. An absurd amount of yeast. I started making bread for friends. All. The. Time. We have a standing date to watch TV? You get bread. I met you once but you taught me Hanabi and I’m going back? You get bread. We were in the same room for a while and you looked like hunger might be a physical sensation you once experienced? BREAD. I was, in fact, in the middle of having my mixer knead a loaf for the Hanabi folk when it started to make a horrible noise, then stopped turning. I removed the bowl, it turns fine. I put an empty bowl in and set it going. Fine. Set the dough hook to have it knead? Nothing. My mixer has died, and I get to hand knead my dough like somebody who bakes to bake rather than as a mildly absurd time management system. Later, I go to the internet. 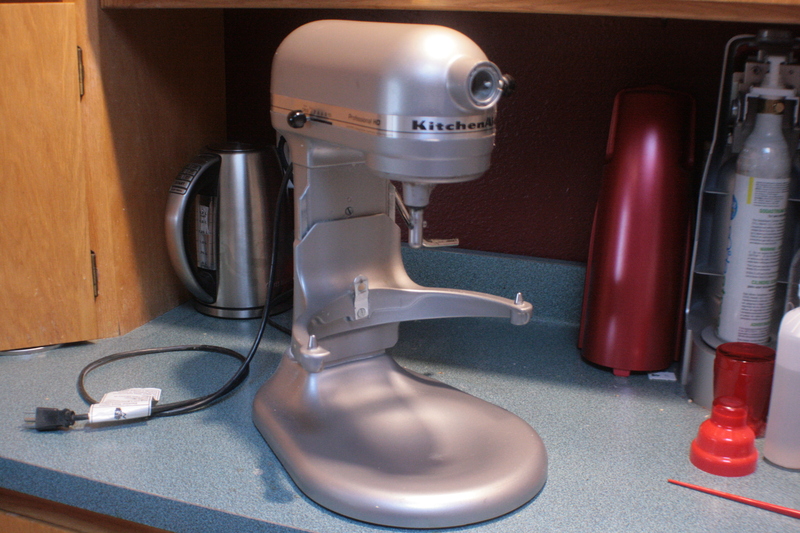 It’s a KitchenAid, which means it’s immortal, right? Nope. But it does at least have a lifetime warranty, right? Nope. 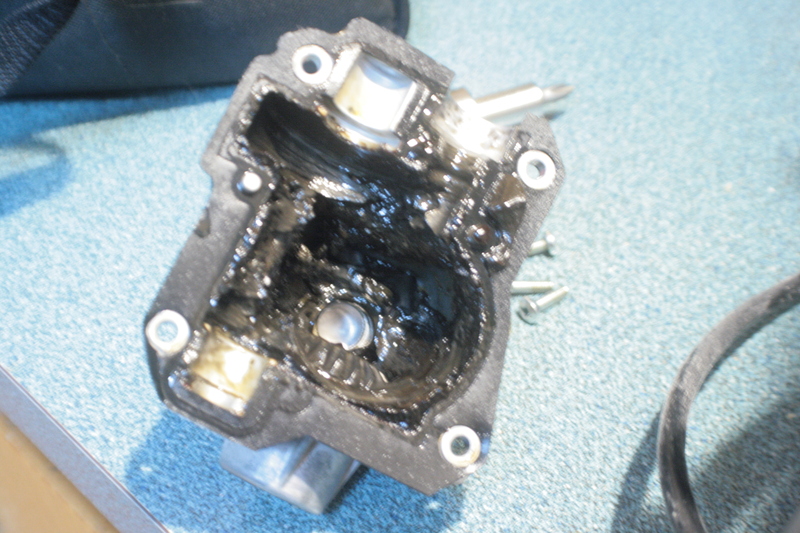 But it is something I can fix, right? Yup! 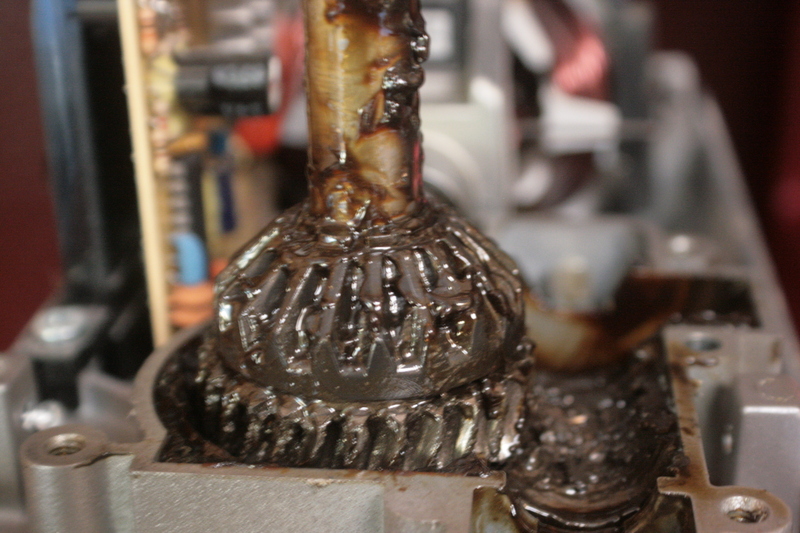 The internet says that this is a thing that happens to KitchenAid mixers all the time, because there’s a gear designed to fail when things are getting worn so you don’t burn up your motor. Just pop the mixer apart, replace the gear, slap it all together and you’re good to go. Easy peasey! I didn’t even think about fixing the mixer until I was back from L.A. Or a few weeks after I was back from L.A. Or until May. Basically, it took the weight of all the yeast I wasn’t using, weighing down on me with tiny little yeast shrieks of “You bought us and we’re going to be wasted and never fulfil our culinary imperative to make things fluffy!” to put this high enough on my priority list to deal with. The first part was easy. 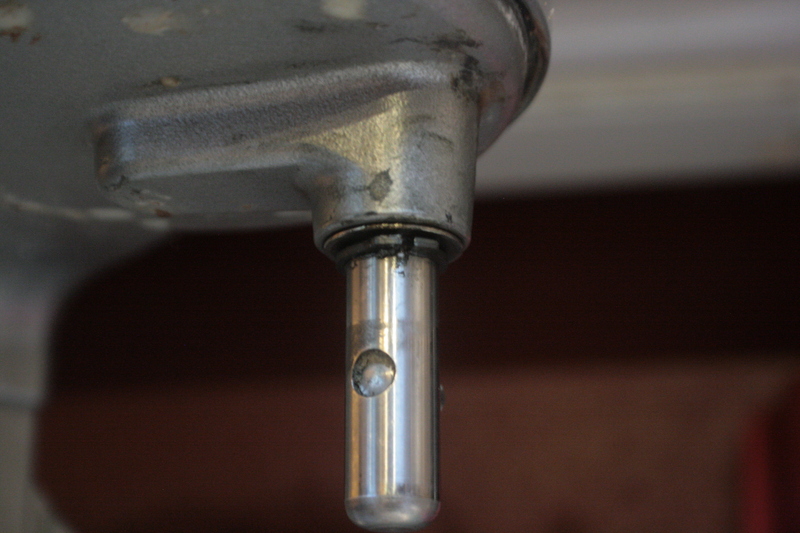 That was just removing the decorative metal band that hides the screws holding the top on. I figured out how to do that without even looking up repair guides. The inside of the mixer is pretty cool. I may have set it to run with the top off just to stare at it and see how the different bits interacted long enough to justify embarrassment. (May have. Certainly didn’t.) The horrible sounds had been coming from the front of the mixer, which is at the left of that picture, so I pushed onward in my disassembly. Dude, there’s been stealth steampunk hiding in my kitchen all this time! Also, hooboy does that grease get everywhere. And there’s a lot of it. A whole lot. “This is seeming pretty straightforward,” you’re saying to yourself. “Why is Anaea making such a big deal out of it?” You’re a jerk for thinking that, by the way. Everything that follows is your fault for doubting me. You see, we’re at the point where, without help, I’m stuck. The gear I need to replace is one of the ones on the left in the earlier photo. The one on the bottom, specifically. I cannot, grab, grapple, beg, or twist as I may, cannot get the top gear off. To the internet for directions! 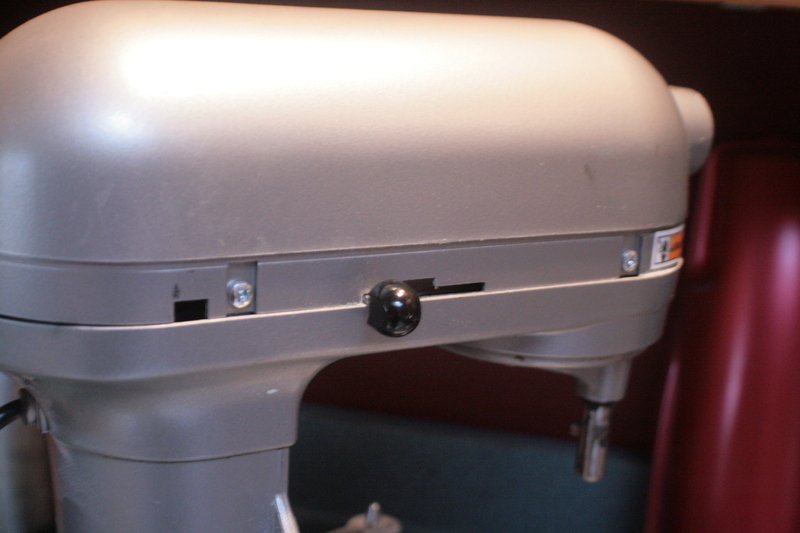 The internet is full of repair manuals for KitchenAids. They’ve been made since forever, and are all put together essentially the same way, so there are tons and tons of copies of the official repair manual. There are videos, There is a universal consensus that what I need to do is get the planetary, the rotating bit that the various attachments hook onto, taken off. There are even diagrams about how to do this. 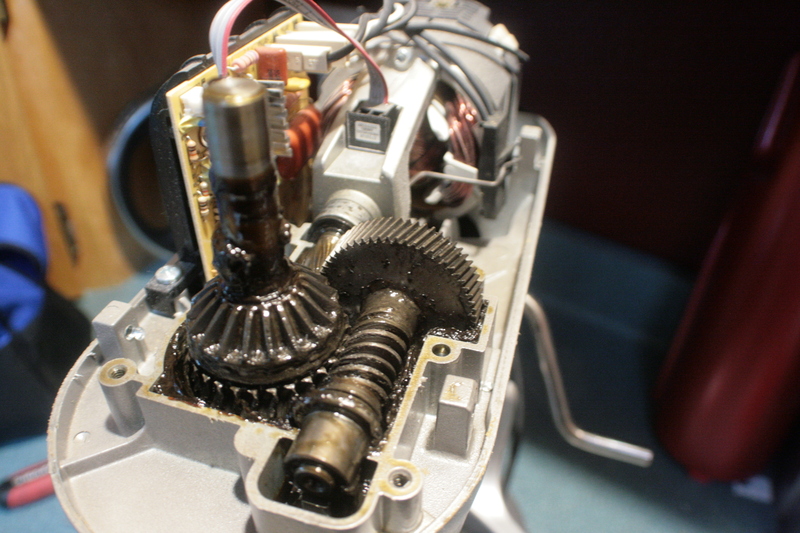 After weeks of plaintively pointing houseguests toward my mixer and saying, “There’s a prize if you can figure out how to get the gears off – careful of the grease,” I poke at the grease a bit. And stare. And cuss. Do you see it? The tiny ring on top of the top gear, holding it in place against rotational forces and incompetent bakers? It’s been there, thwarting me, the whole time and I’ve never spotted it because it was so covered in grease it looked like just a lump of it. 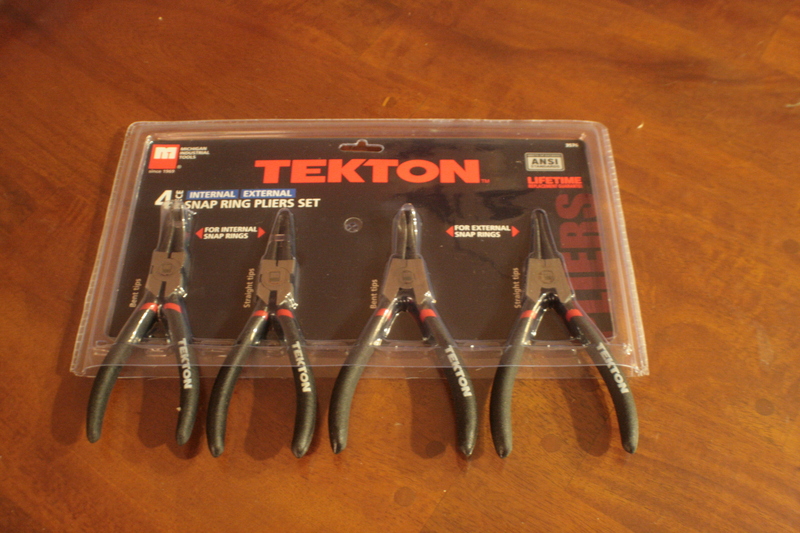 But now my problem is solved, so I break out the screw drivers and scissors and… It is now August. I went to three different hardware stores, and finally broke down and ordered them from Amazon because the hardware stores were not helping. I only needed one of these, and will never need them again, but I have them now. The yeast voices, begging to be turned into bread before I pack up all the possessions I’m keeping and flee to Seattle, leaving the rest behind, are constantly sobbing at this point. Armed with pliers, I do it. I get the gears off, I put new ones in. I have a whole can of new grease I use to coat everything. I put it all back together and it rotates and is lovely and works. I make brownies. Delicious! I make bread. Two minutes into the kneading cycling, there’s a horrible grinding noise, and then the mixer refuses to rotate. At all. Even if there’s no resistance. My mixer is now more broken than it was in March before I started repairing it. I have no idea why. I also don’t care. I haven’t had troubleshooting/repairing a problem go on and spiral like this since I switched to Ubuntu lo these many years ago. I’m calling in a professional. The professionals say they’ll charge half as much as the mixer costs to buy new. That still saves me half of the price tag on a new mixer, but it’s not exactly the level of frugality I’d been hoping for. The questions start. Do I still even need this mixer? Will I make bread in Seattle like I do here? Wouldn’t I rather just walk to some delicious local bakery and buy their bread all the time? Will this mixer even fit in my future unknown kitchen? I would decide to wash my hands of the whole thing except the yeast. The giant packaged of unused yeast. I will never, ever use it if I have to hand knead every loaf. I went to Costco. 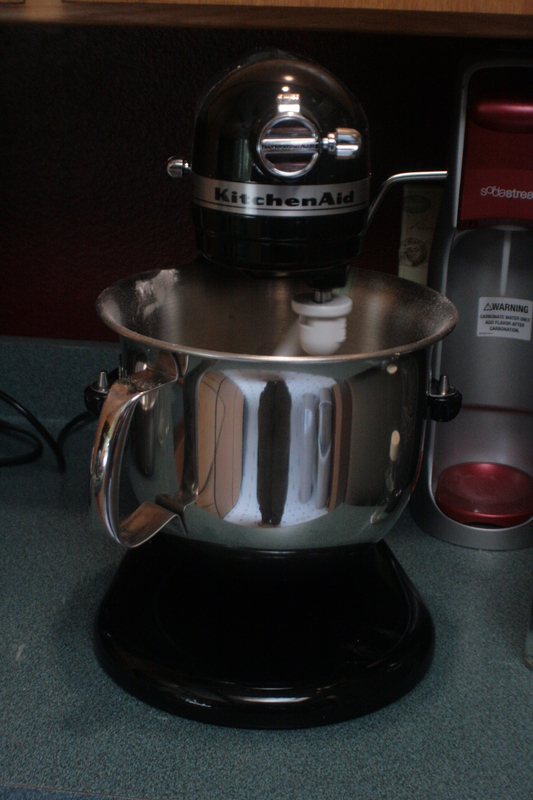 I turned my old broken mixer into a brand new, very shiny mixer. I should have given up in March. Also, Costco is the best. I’m proud of you for trying to fix the mixer. Had you a knowledgeable friend to call to advise, I’m sure that you would have succeeded. My philosophy is that very few of us are geniuses. Everything we own is made by folks no smarter than ourselves and we can fix anything. Women are often at a cultural disadvantage, having never been encouraged or, sometimes even allowed to tinker. These days, sadly, men, increasingly almost pride themselves on their mechanical ignorance. 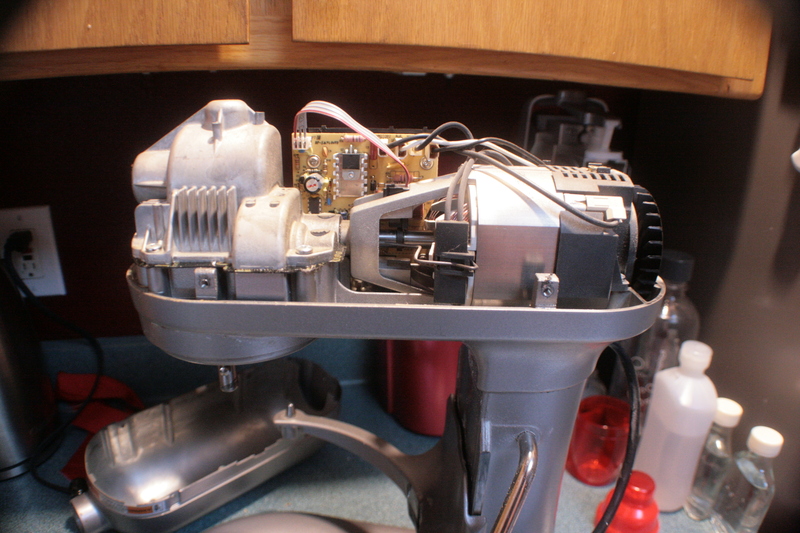 There’s a real sense of satisfaction in fixing or maintaining a well made device, such as your Kitchenaid. And yes, Costco is terrific!